Established in 1995, based in Surrey with offices and a showroom in London, April Hamilton Interior Design has flourished over the years and our expertise is now consummate. Over the years, they have had the privilege on working on a variety of beautiful properties, including listed buildings, country estates, hotels, apartments and many commercial properties, in their own community and overseas. Q: April Hamilton operate with a worldwide client base. Can you tell us which countries you’ve enjoyed working in the most and how the region influenced your designs? It has to be Palma. It’s my favourite island: an oasis of sophisticated calm with the most wonderful light any artist would want to capture. The stone is so incredibly tactile – it permeates through the designs. Q: Where does your passion for design come from? Where did it all start? I didn’t know what “style” was. I was just told I had impeccable taste, which made me believe I could be of assistance to others. I instinctively understood the building process. Mixed with a passion for all things beautiful made a wonderful combination to train as an interior designer/architect and whilst we can train, I feel true design comes from the heart. I have been humbled on many occasions as my interiors have been described as soulful. Q: How do you describe the signature style that your clients are drawn to? Q: Having worked on projects within listed buildings, country estates, hotels, apartments and commercial properties, what domain do you enjoy most and why? My very first project was a 36 room estate, with 4 outbuildings and listed as a Grade I – something to cut your teeth as a designer and a dream for many. How lucky was I when the owner declared “we don’t need an architect – you can do it”? With that level of faith how could I fail? And so I stepped up to the challenge. Back in the day when country house meant all things Colefax and Bennison, fabric walling was a must and a kitchen just had to be the lovely Late Mark Wilkinson, it was the best break I ever had. A few editorials later and I hooked up with a property developer, again very much in the Listed building arena & 34 properties later, AH really started to develop a brand. Q: What have been some of your most memorable projects? A beautiful thatched house in Esher – my heart & soul went into that. Q: What has inspired your most recent projects? The architecture. It was a detached double fronted early Victorian house over 6 floors, introducing a cinema room was fun and utilising the roof space. Q: What are the biggest challenges and rewards when designing interiors for the luxury property market? Keeping your client on board. It’s understandable to be hesitant, but remember why they came to you initially. Education and patience is key. Staying true to the design concept is always the greatest outcome. Q: What do you think about on the way to the office or to meet a client? Is there coffee en route…? After that, the design brief oscillates around my mind until we can sit with Pinterest and bring the project to take its first breath. Q: Does your team work with surface materials such as polished plaster, concrete, relief plaster and impasto? What materials do you enjoy working with most? Yes, although, our clients brief is the cornerstone of our designs and sadly sometimes I have to reign back my initial design thoughts, despite polished plaster being one of my personal favourites. Q: Finally, what exciting new projects are your team currently working on? 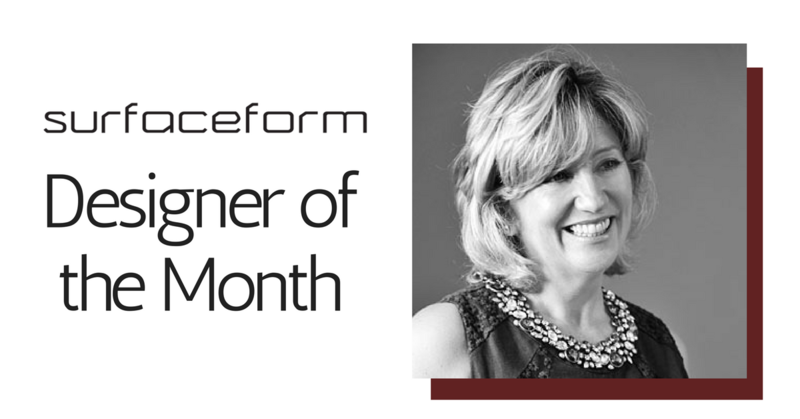 Surfaceforms’ Designer of the Month is a place where we celebrate the great art and design professionals making our industry better. If you have any suggestions for who we might interview next, please email laura@glazedigital.com.